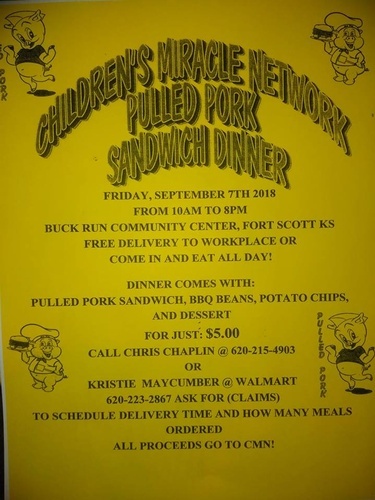 Children's Miracle Network Pulled Pork Sandwich Dinner on Friday, September 6th at Buck Run Community Center. Free delivery to workplace or come in and eat all day! 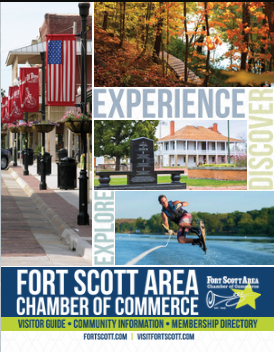 Dinner comes with pulled pork sandwich, bbq beans, potato chips, and dessert for just $5.00. You may call Chris Chaplin at 620-215-4903 or Kristie Maycumber at Walmart at 620-223-2867 and ask for Claims to schedule delivery time and how many meals ordered. All proceeds go to CMN! Friday, September 6th from 10am-8pm.